Arc’teryx is a Canadian company founded in 1989 in North Vancouver, British Columbia. It was originally named Rock Solid by the company’s founder, Dave Lane. It was called Rock Solid because, originally, the company only sold gear for rock climbing. In 1991, the name was changed to Arc’teryx, which stems for the word Archaeopteryx, which is the name of the very first bird ever identified. From this point onward, the company stocked items needed for multiple outdoor activities. The company’s best-selling items are related to climbing, backpacking, hiking, snowboarding, and skiing. The company’s single most popular item is the vapor harness, which they created. They also have a popular line called LEAF, which are products aimed to serve Law Enforcement and Armed Forces. The company is now owned by Amer Sports, but the headquarters is still located in British Columbia, Canada. Arc’teryx hiking gear is well-known for fine quality, good durability, and comfort. With that in mind, there are many unique features that are specific to the Arc’teryx Altra 65 Pack. The Altra 65 is the company’s second version of this particular backpack. The first one was called the Arc’teryx Altra 75L. One useful feature is the extendable collar and extendable top flap that allows easy expansion for large loads. Also, the presence of two storage chambers provides easy access and organization. Another feature is the C2 suspension system. The C2 stands for composite construction. This, along with the Twin 6005 T-6 aluminum M-bar, allows for lightweight, yet sturdy, construction of the backpack. There is a hydration sleeve with an external access tube. The size of the hydration bladder is 3 liters. The bladder is fully removable to provide ease with cleaning. GridLock shoulder straps are adjustable vertically and horizontally; therefore, a perfect customizable fit can be achieved. There are 2 side mesh pockets available. They provide perfect locations for additional bottles or snacks within easy reach. 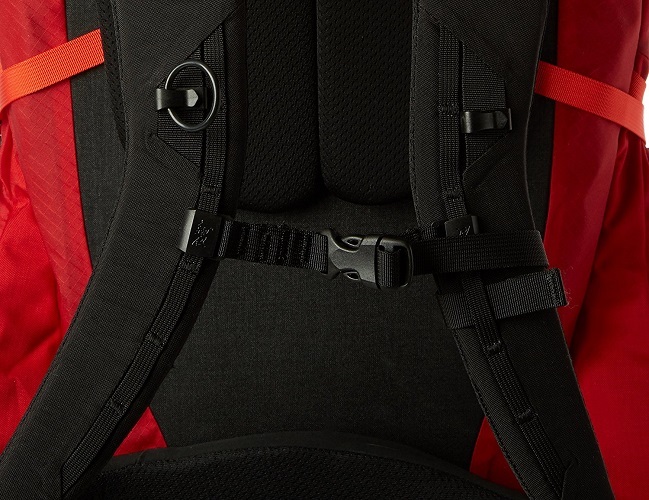 The back of the pack sits away from the body, allowing breathability room down your spine. Rotating Load Transfer Disc sends weight of pack to rest on your hips, thus providing great relief and movability of your back. Now that some general information has been covered about the Arc’teryx Altra 65 Pack, let’s look more closely at distinctive qualities about the pack. The logo on the Arc’teryx backpack is that of an Archaeopteryx, the first bird ever identified. The picture of the bird is based on the “Berlin specimen”, which is the most complete skeleton of a bird ever found. This is the reason for the “all bones” symbol that represents Arc’teryx. 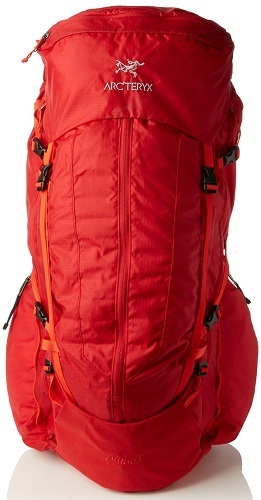 The Arc’teryx Altra 65 backpack is available in 3 colors: Carbon Copy, Diablo Red, and Iron Oxide. Carbon Copy – A sleek, smooth color that hides dirt and stains easily. Looks nice with any hiking styles. Rugged, classic, and attractive. Diablo Red – A color that is bright, electric, and bold. Looking for a color that will stand out and make a fashion statement? Diablo Red may be the right choice for you. Iron Oxide – A style unlike any other. Iron Oxide is a beautiful, deep, rich orange color that looks serene, similar to the orange glow of a sunset. Unforgettable and unmatched in uniqueness. 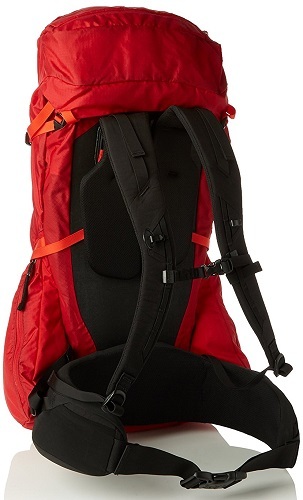 The Arc’teryx Altra 65 backpack also comes in 2 different sizes: Regular/Short and Regular/Tall. The materials that are used in the frame of the Arc’teryx Altra 65 are Aluminum, EVA foam, and HDPE framesheet. These materials provide a strong foundation that will provide years of service to any hiker, yet lightweight enough not to be too burdensome. The materials that are used in the pack are 100-denier Invista HD Mini Ripstop nylon and 210-denier Ripstorm nylon. The combination of these materials creates a lightweight, yet strong material needed for a sturdy, durable backpack. The pack is also coated with a silicone/polyurethane mixture that helps prevent tears and water damage. 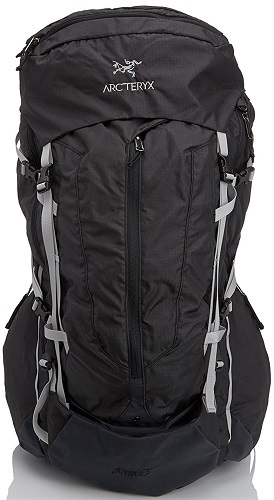 The Overall Style and Design Rating of the Arc’teryx 65 Pack gets 5 out of 5 stars. This Arc’teryx backpack is not unlike any other Arc’teryx backpack; it is very good quality, while also very fashionable and functional. The Arc’teryx Altra 65 Pack is very comfortable. The shoulder straps are adjustable, as well as anatomically shaped. They feature a layer of air-permeable foam lined mesh for instances when your skin rubs against them. They are also simple to adjust either vertically or horizontally for a perfect fit for you. The hipbelt with the brilliantly designed Rotating Load Transfer Disc allows freedom with your movements and allows the heavy weight of your load to rest on your hips and not your lower back. 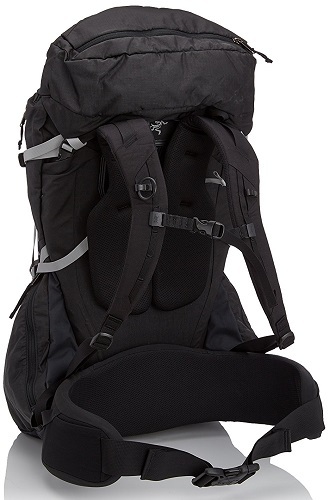 This also distributes the load well and makes the backpack seem lightweight on your back. This feature may save you unbearable back problems as you enjoy your hiking adventures. Also, the frame of the pack allows airflow between your back and the pack itself, which will prove refreshing on a hot, muggy day. Finally Arc’teryx offers a “Practical Lifetime” warranty. Basically they will take into consideration the condition of your gear when granting a warranty request. If you’ve used your gear to the point it’s more due to wear and tear than actual craftsmanship then you may not be eligible for a warranty. The Overall Comfort Rating of the Arc’teryx 65 Pack gets 5 out of 5 stars. Once again, Arc’teryx products maintain a high-quality rating again and the Altra 65 is no disappointment as far as comfort measures. It is a wonderful combination of comfort and durability that sells this backpack to avid outdoor enthusiasts. The Arc’teryx Altra 65 Pack is extremely durable. The combination of heavy-duty nylon, lightweight yet strong aluminum frame, and almost indestructible hardware make this backpack an excellent choice for durability. The lightweight yet strong aluminum frame is a godsend as it’s designed to take a beating and keep on kicking. Plus it doesn’t hurt that it hardly adds to the overall weight of the backpack. The base of the 2 zippered compartments is made of a heavy-duty 420-denier Invista HD plain weave nylon. This burly base will provide many years of wear and tear from packing, loading, sliding, and skidding that any hiker may encounter. 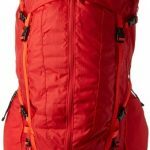 The Overall Durability Rating of the Arc’teryx 65 Pack gets 5 out of 5 stars. Arc’teryx products are known have a high-quality rating, and this product supports that claim. The materials used in this backpack are sturdy yet lightweight. This is a product that is crazy good and you will not be disappointed with its’ durability. 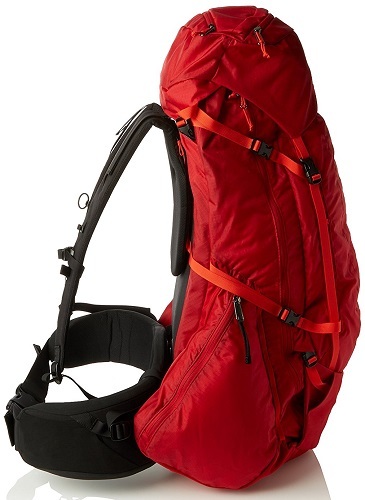 As you can see, the Arc’teryx Altra 65 Pack is one that is filled with unique, useful features. Anyone who is a novice or an expert hiker cannot go wrong with this supreme backpack on the trail. The Overall Features Rating of the Arc’teryx Altra 65 gets 5 out of 5 stars. Anyone would find it difficult to find one, single pack with as many useful features as this one. If you are planning to explore the wilderness, this pack will be extremely beneficial to you. This is the one area where the Arc’teryx Altra 65 Pack might cause a problem for some folks. The backpack is very expensive. Is it worth the money? Most people agree that it is worth it. If you find that the size or color you want is out of stock, give Osprey’s Atmos 65L or Aether AG 70L a try, they are both great alternatives! Arc’teryx products have been known for their high quality since their beginning in 1989. With the sturdiness and durability of their products, they have surpassed the test of many experienced outdoorsmen and have surpassed the test of time. Their products are going to last for many, many adventure trips. The Altra 65 Men’s Pack is no exception. It is a product that will not disappoint you, if you decide to spend the somewhat excess money on purchasing it. This is a good, if not great, quality backpack; however, the price tag is pretty steep. It may benefit you to shop around and compare a variety of backpacks to see which features you really desire and what budget you want to have for your purchase of a backpack. Excellent quality – from the nylon and aluminum that create the backpack to the fine, sturdy hardware that holds it all together, this is one, fine piece of hiking equipment. The Arc’teryx name really holds up, as far as quality with this pack. Very comfortable backpack – from the customizable shoulder straps to the unique Rotating Load Transfer Disc that allows for a pivoting motion within the hipbelt, this pack surpasses many of its’ competitors. Very stylish – variety of color choices to pick which style works best for you, and unique Archaeopteryx symbol for company logo proudly displayed. Practical Lifetime warranty — having any kind of warranty on your product is a good idea. Luckily Arc’teryx will cover your gear for it’s “practical lifetime”, meaning that they will take general use wear and tear into account. Perfect for the outdoor enthusiast who loves to hike. High price! This may be a deal-breaker for some buyers, but for those that decide to “go-for-it”, they should not be disappointed. Appearance of “squeaking” around the hipbelt has been reported by some previous users. May be difficult to find color choice, due to the fact that stock is limited. Practical Lifetime warranty — this deserves to be both a good and bad aspect of this backpack. While better than nothing, the practical lifetime aspect of this bag is a little substandard to other backpack brands in this category and for the price you’re paying for this backpack I would expect a little more from Arc’teryx. The Arc’teryx Altra 65L Pack is an excellent quality backpack that has many practical features for the avid or beginner hiker. It has fine qualities of comfort, durability, and style; although, it can be on the pricey side of current backpack options. Investigate your options and decide if this good quality product is the one you are looking for, as a pack that will provide you with years of service. The Overall Rating for the Arc’teryx Altra 65 – Men’s Pack is 4 out of 5 stars!